Illustrations note 10 Tables, black and white; 556 Illustrations, black and white; XIV, 426 p. 556 illus. Introduction.- Statistical Learning.- Linear Regression.- Classification.- Resampling Methods.- Linear Model Selection and Regularization.- Moving Beyond Linearity.- Tree-Based Methods.- Support Vector Machines.- Unsupervised Learning.- Index. Gareth James is a professor of data sciences and operations at the University of Southern California. He has published an extensive body of methodological work in the domain of statistical learning with particular emphasis on high-dimensional and functional data. The conceptual framework for this book grew out of his MBA elective courses in this area. Daniela Witten is an associate professor of statistics and biostatistics at the University of Washington. Her research focuses largely on statistical machine learning in the high-dimensional setting, with an emphasis on unsupervised learning. 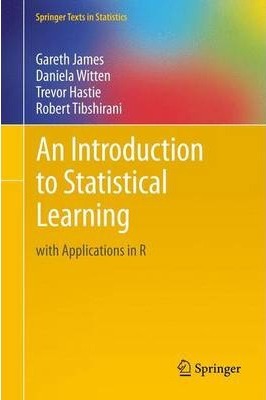 Trevor Hastie and Robert Tibshirani are professors of statistics at Stanford University, and are co-authors of the successful textbook Elements of Statistical Learning. Hastie and Tibshirani developed generalized additive models and wrote a popular book of that title. Hastie co-developed much of the statistical modeling software and environment in R/S-PLUS and invented principal curves and surfaces. Tibshirani proposed the lasso and is co-author of the very successful An Introduction to the Bootstrap.